SP Jain School of High Technology presents its Advance Recruitment Program for enrolling students. A unique opportunity to interact with potential top recruiters and be considered for a Pre-Placement Shortlist or even a Conditional Pre-Placement Offer. The school offers 6-month immersive Post Graduate Professional Specialist Programs delivered by top academics in association with leading industry partners. 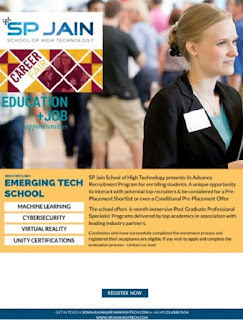 The school offers a suite of 6-month certification courses such as Machine Learning, Cybersecurity and Virtual Reality designed to develop Emerging Technology experts who are able to apply the latest technologies and strategies to create cutting edge solutions & solve complex business problems. Names of the companies/ faculties that would be joining us at the occasion along with corporates from the industry as well. Wipro, ITC InfoTech, Infosys, SAS, Microsoft, Symantec, BT Security, Unity Technologies, E&Y, IDC etc.